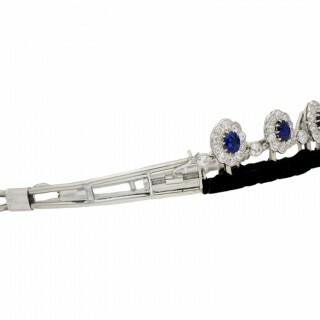 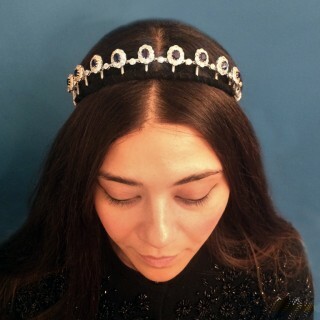 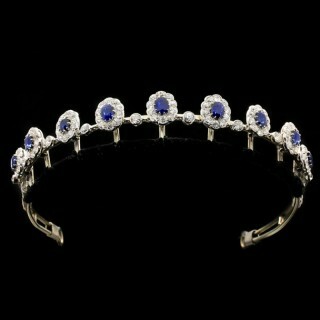 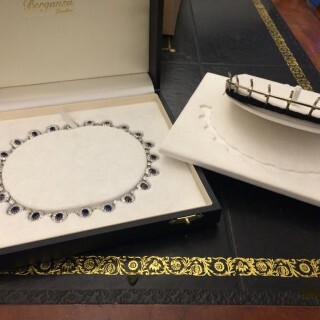 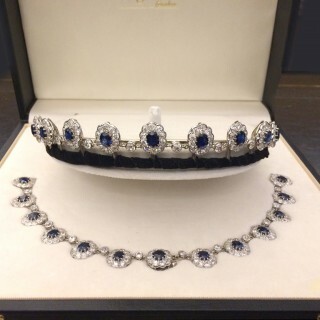 Burmese sapphire and diamond necklace/tiara. 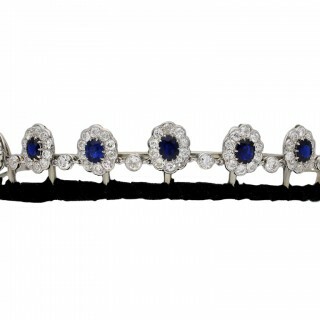 Set to the centre with twenty two cushion shape old cut natural unenhanced Burmese sapphires in open back claw settings, ranging from smallest with a weight of 0.98 carats to largest with a weight of 1.87 carats, with a combined approximate weight of 32.94 carats, alternated by twenty two round old cut diamonds in open back rubover settings with a combined weight of 8.00 carats, embellished with sixty two round old cut diamonds in open back half rubover and grain settings with a combined weight of 11.00 carats and further enhanced by one hundred and sixty round old cut diamonds in open back half rubover and grain settings with a combined weight of 19.00 carats. 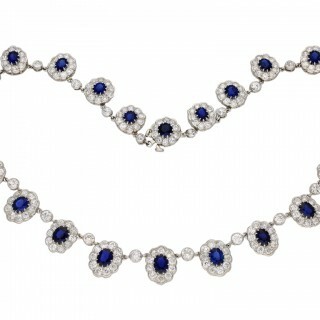 The total approximate diamond weight is 38.00 carats, to an impressive articulated necklace featuring twenty two coronet cluster links with intricate curving claws, linked with circular openwork collets framed by polished borders, each link finely pierced with linear galleries and fancy backholing, fitted with an integrated push clasp and hinged safety latch, approximately 18.5″ in length, featuring a removable section of nine coronet clusters which convert to an elegant openwork tiara with black velvet lined tiara frame, approximately 2.8cm in height at highest point. 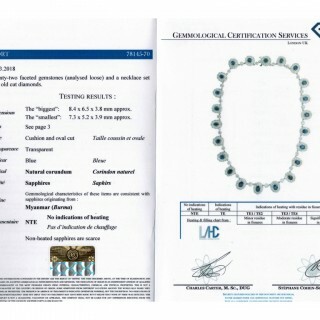 Tested platinum, circa 1920, accompanied by Gemmological Certification Services report #78145-70 and fitted black box. 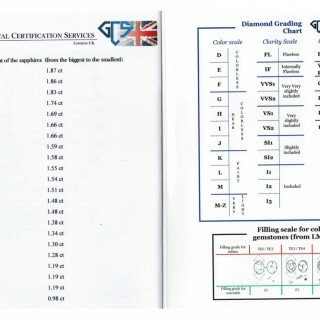 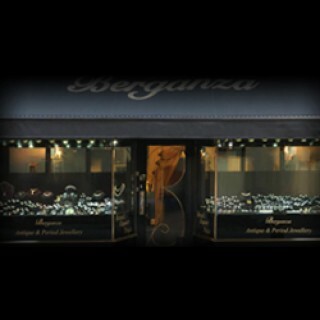 Refer to gemmological report for a comprehensive list of individual sapphire weights.